In the last blog posting on a Ghanaian restaurant serving a good rendition of the West African dish, Fufu, (read blog), I mentioned its location round the corner from a favorite Korean haunt of mine. Myong Dong has been in the same strip mall since I visited it for the first time during my graduate school days 26 years ago (OMG!!). Ever since then, I paid it many visits during lunch time on days when school was out or during the holidays. I never considered writing about this place due to the infrequent stop-in’s, but recently, I realized that it was worth mentioning this eatery on my blog site. Walking in the space, you are confronted by a neat looking space with simple yet appealing wooden tables and chairs. After placing the order and being served some water or hot barley tea, an array of different side dishes would appear in front of the diner. 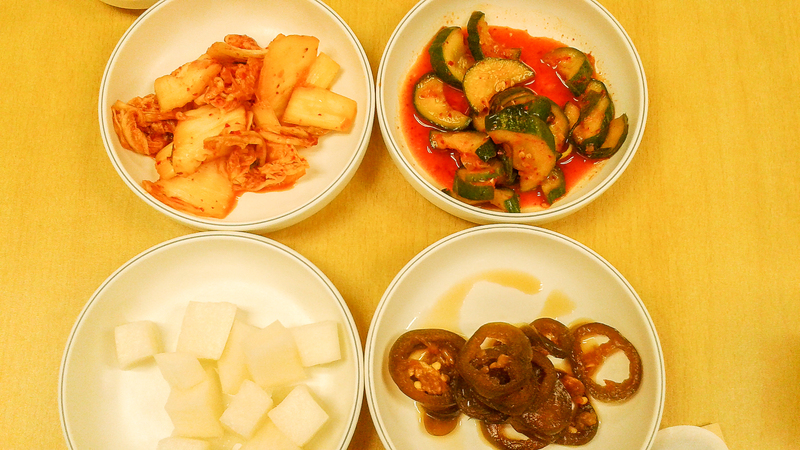 I must say that I am fond of this aspect of Korean cuisine, and I have had my fair share of these preludes to the meal. 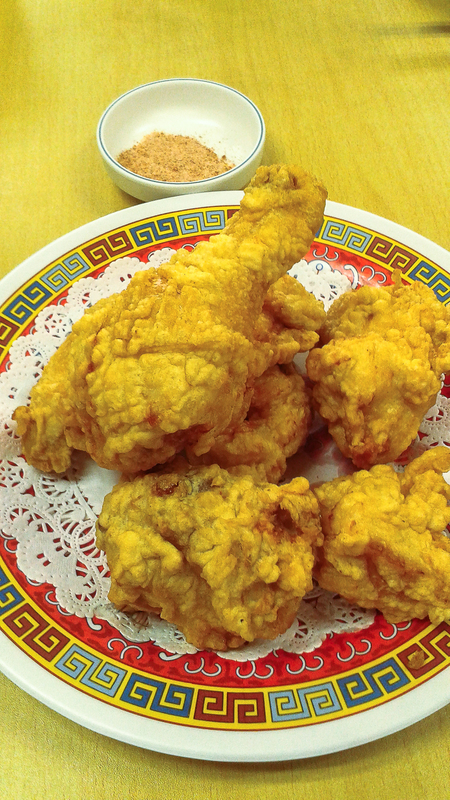 What Myong Dong serves up is not the same quantity as some other establishments, but the few, around 3 or 4, are best judged for their quality and flavors. The Kimchi tastes quite fresh and having been given the proper marination, the Napa cabbage is slightly wilted while tasting spicy from some chili and ginger, and slightly sour to balance the flavors. Another dish is pickled Daikon. Cubes of the white root vegetable is still crunchy without tasting raw, exuding some sweet and rice-vinegar sourness, good enough for one to ask for another serving and sip that sweet vinegary liquor. Pickled Cucumber is also another mainstay. Pieces of unwaxed baby cucumber tasting slightly crunchy from its skin and soft on the inside have been marinated with some chili paste and vinegar. Infrequently, Pickled Green Chilies make an appearance, exuding its natural capsaicin heat along with its pickling of soy sauce, sugar, and vinegar. I must say that I would devour these sides before my main course, and I always ask for refills during my meal. If I could, I would make a meal out of them for they are just oh-so-good. 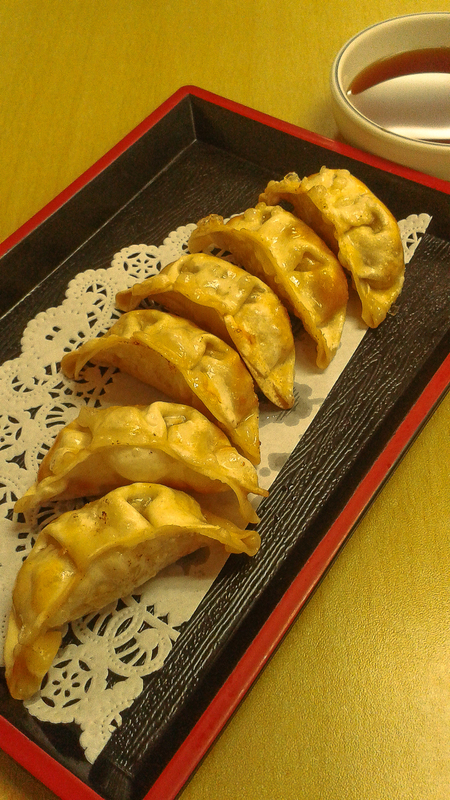 It would be amiss to eat at a Korean restaurant without trying their Mandu or Stuffed Dumplings. For many years, I would order their lunch specials, and the dishes would arrived with a couple of these fried small bites as part of the combination. Each time, I was taken aback by how good they were. So, on one visit, I placed an order from the appetizer section which comes in either 6 or 12 pieces. This separate order only reaffirmed my take on them: the perfectly crispy thin skin encapsulated a meat stuffing that was both fragrant, with a good hit of white pepper, and savory at the same time, making one to savor every morsel of these tasty delights. As if these dumplings were not good enough, there is a side sauce that takes them beyond the stratosphere with the flavors of soy sauce, rice vinegar, sugar, and perhaps Mirin, making it a completely sippable elixir. These small fellows do make big strides indeed on the tongue with their awesomeness. Lunch time is usually the time for my visits to this place in order for me to take advantage of the reasonably priced lunch specials. 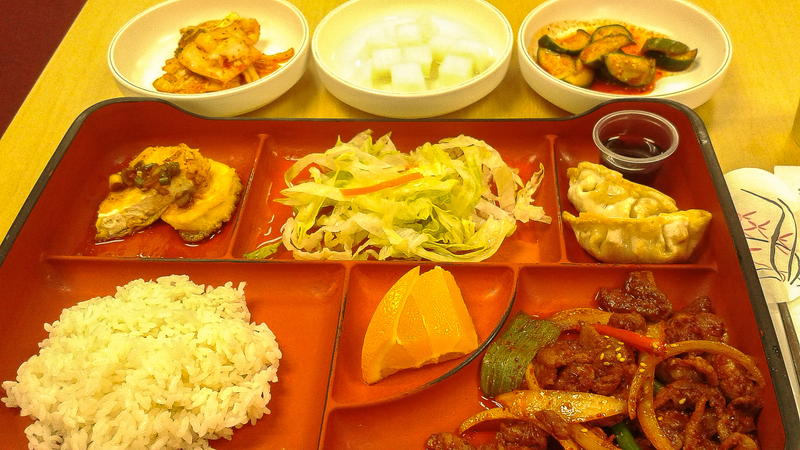 Most of the offerings are marinated meats served in Bento-styled boxes. One of my favorites is Spicy Pork. What arrives is grilled meat tasting spicy from a good marination with some chili paste and slightly sweet to balance the heat, mixed with some sweet peppers and onions. What I appreciate about the meats here is that they are properly marinated for a length of time before sweating it out on the grill; the same goes for the beef and chicken orders. Accompanying the meat are usually some rice, a simply crispy salad, those irresistible fried dumplings, some pieces of fried tofu in sauce, and a slice of fruit – a true balance of Ying and Yang. With those delectable side dishes to go along with the main dish, what more could I ask for during my lunch time? 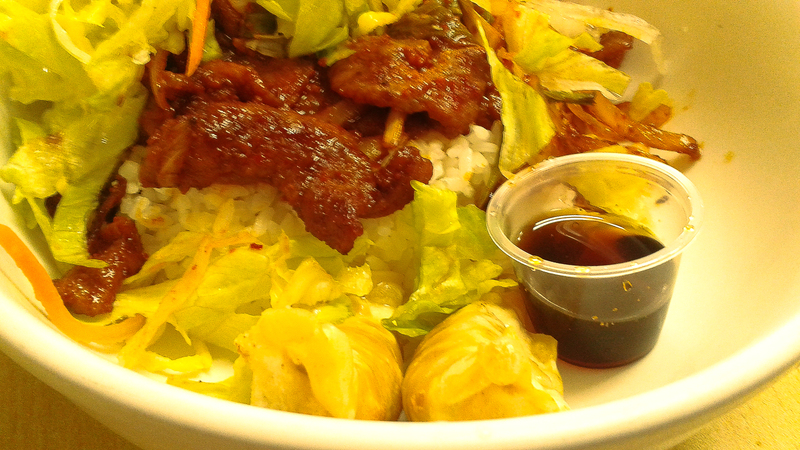 Another order from the lunch special menu is Rice Bowl. The bowl arrives with pretty much the elements of the previous dish: grilled marinated meat, salad, and fried dumplings, strands of egg and toasted seaweed sheets, all sitting on a mound of rice. But here, there is an addition of chili paste to be mixed in with all the aforementioned, allowing the diner to control the amount of chili heat to one’s liking. So depending on my mood, I would order this bowl when I want all the parts coming together, or the box if I am in the mood for something deconstructed. Either way, both are winners in my stomach. Beyond the lunch specials, I found a couple of dishes that are also in my repertoire of favorites, Be Beam Naeng Myun being the first. 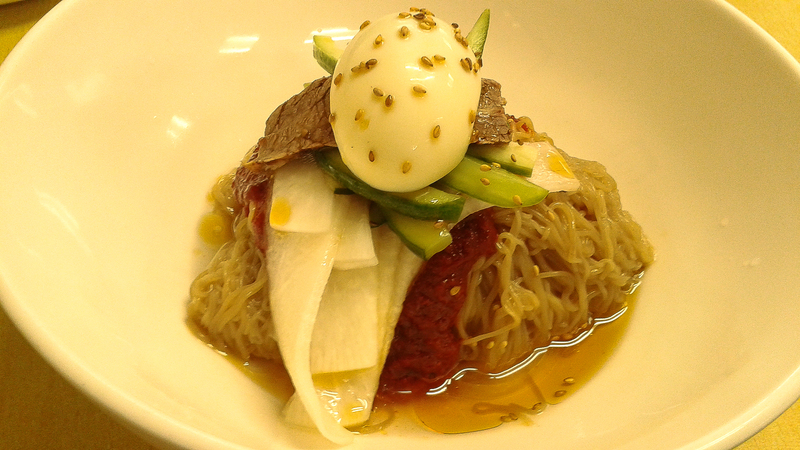 The bowl arrives with a mound of cold buckwheat noodle topped with some spicy bean sauce, slices of pickled daikon, raw cucumber, slices of cooked brisket, a boiled egg, all sitting on a pool of chilled sauce. A couple of scissor snips of the noodle and a good mix of the elements brought the dish together to its gestalt height. Every element contributed to that effect with the rather firm noodles, the sweet spicy paste, the vinegary daikon, the cool crunchy cucumber, the beefy brisket, the rich egg, all enveloped by the savory chilled sauce laced with fragrant sesame oil. This dish is a definite hit for me, especially while we are still enveloped by the summer heat. The other dish is like the above, a noodle dish, but in a spicy soup form – Jam Pong. 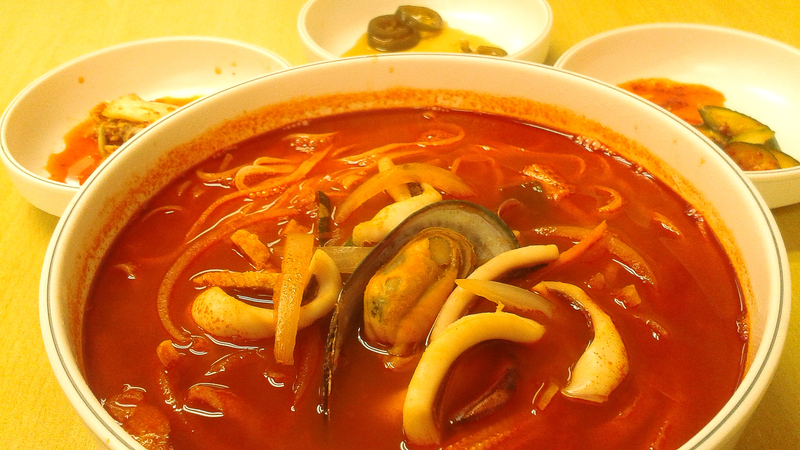 The bowl arrived with some thick noodles swimming in a fiery red soup, with bits of mussels, pork, squid and baby corn accompanying the main starch. The seafood was perfectly cooked, tasting sea sweet and fresh, the vegetables cooked and adding their vegetal sweetness, and the noodles tasting home-made and al dente. But it was the soup that brought the tasty bits together, with its depth in flavor and spiciness that was both searing and alluring. In the last couple of orders, the mussels were overcooked, and I will make it a point to request the kitchen not to overcook them since I truly enjoy this spicy noodle bowl. On a number of visits, I noticed that some diners were feasting on some Fried Chicken. With that in mind, I decided to try their rendition which comes in half or whole chicken. My order was the half bird chopped up into large pieces, dipped in batter and deep-fried. One bite into a piece revealed its true nature. The batter was not the seasoned flour type, but a barely seasoned rice flour coating. The meat was cooked through, including the pieces of breast meat that were still moist, but again, not as seasoned as I thought. A dip into the side salt mixture was the secret in its eating that provided the necessary seasoning and flavors that “woke” these pieces up. In other words, the pieces of poultry was the canvas to the salt seasoning that was a secret (according to Mrs. Chef) mixture of salt, chili powder, and other ingredients that made it de rigueur for these crunchy bites. Once I could wrap my brain around this distinctive approach of fried chicken, I began to enjoy and appreciate this unique version. However, I would have preferred the poultry cooked a couple of minutes more, and I will request such an order for that extra crispiness. It has been hard thinking of a Korean eating establishment to write on, but ultimately, I resorted to a place that I have been patronizing all these years since I have been living in Maryland. Yes, it is not a big space nor do they offer a wide variety of dishes usually found in bigger eateries. But I have always enjoyed their marinated meat lunch specials, fried chicken and the noodle dishes, as well as those side dishes that keep calling my name every time I take a seat there. Now with lunch specials offered the whole day on Sundays, I have another reason to indulge in these Korean treats.